They call it 'the beast' and it certainly looks the part but then you hear the numbers - 180+PS, 195kg and 2.6s (claimed) to 100kmph. 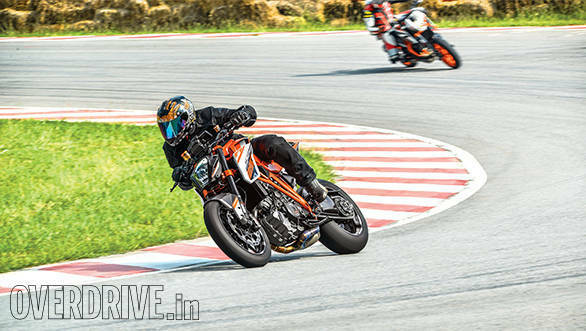 Sitting in a room knowing that I'd be riding the menacing KTM 1290 Super Duke shod with slick tyres, in less than 24 hours, I could feel a tingle of anticipation mixed with a healthy dose of fear welling up inside my stomach. And no, it wasn't the noodles I'd had for lunch. It doesn't help matters when veteran MotoGP rider Jeremy McWilliams adds, at the end of the product presentation, that the biggest problem he has with racing it, is keeping the front wheel down in practically every gear. It's easy to see why I didn't get much sleep that night. 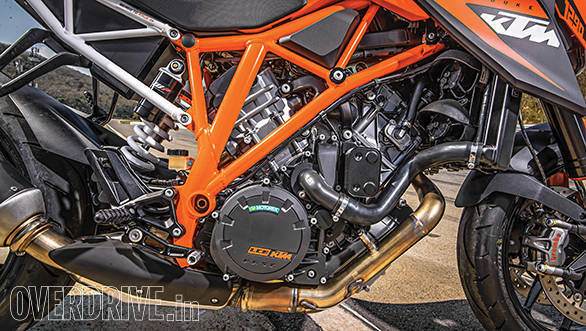 KTM is very proud of their naked motorcycles and the success of the Duke series has opened up a massive street motorcycle market for the Austrian 'dirt bike' manufacturer. The Super Duke has been the flagship model for their naked lineup since 2005 and the 990 Super Duke really set the bar high. 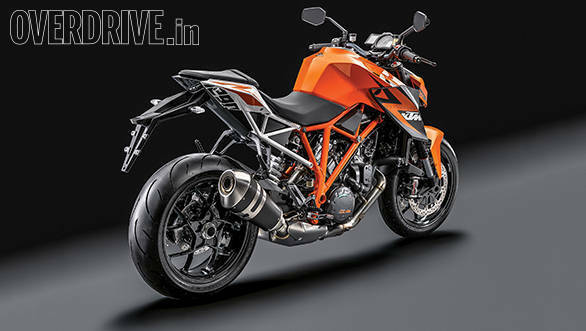 In designing its replacement, the 1290 Super Duke, the crazy engineers at KTM have taken things to an all new extreme. The street going 1,301cc engine makes 177PS and 144Nm, a torque figure that shames many litre-class, race bred motorcycles. In addition to heaps of power and torque, it's also packed to the brim with technology. There's a slipper clutch, ride modes, multi level traction control, anti-wheelie control and ABS that can be switched off. Early on in the design process they called on the expertise of Jeremy McWilliams to help with its creation. And though he's a true blue racer at heart, he actually helped build a very comfortable motorcycle. 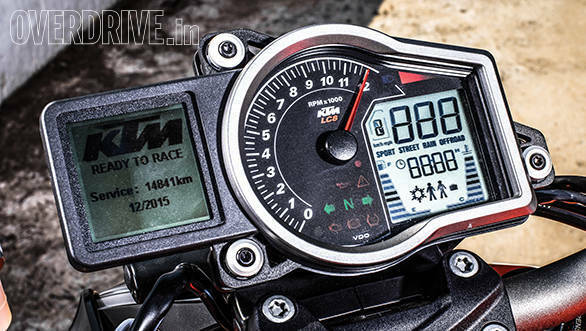 "If I am on a street bike, I do not want a race position. I want to get comfortable." He might be very comfortable but I'm squirming in my seat listening to the safety briefing he's giving us. "You should hit 240kmph on the straight before you brake, you better brake early though as there is no run off for turn one." And this continues through the briefing as he describes the Bonanza Circuit in Thailand. No run off here, a wall there and poor surface on Turn 8, not quite what the doctor ordered for a ride on the 1290. We were to go out on 690 Duke Rs for the first session to get a feel of the track before graduating to the 1290 Super Duke R and then in the last session we'd move to the race prepped 1290s  slick tyres, full Akrapovic aftermarket exhaust system, track suspension setup and over 180PS on tap. We're asked to leave traction control on with the ride mode set to Sport for both motorcycles on account of the tricky conditions out on track. And then there's a surprise for me. There are too few 690s available for our group so I'm the lucky one who goes straight out on the 1290 R.
Having just hopped off a 390 Duke I rode on the way to the track, the 1290 immediately feels like a much larger motorcycle. You also sit inside the bike rather than on it, but there is a comfortable reach to the flat bars over that large fuel tank and the foot pegs allow for a very comfortable riding position. Thanks Jeremy. With the first proper prod on the throttle 'the beast' immediately lets you know that there is some serious horsepower and torque on tap. Down the straight was the only place on the tight circuit where I could crack the throttle wide open and after a rather slow third gear left hander, the long 600 metre straight disappeared blisteringly fast. For a large motorcycle it turns very quickly, not quite as quick as its smaller siblings but fast none the less. The suspension is also firm but over the bad, bumpy surface around Turn 8 it was forgiving as well. But the biggest impression you're left with is how brilliant that torque laden motor is. In any gear, at any speed, you just open the throttle and it literally takes off, front wheel skimming the surface of the track, anti-wheelie software working overtime. The first session was over before I knew it and then it was time for the race prepped version. There were butterflies fluttering in my stomache as a polite mechanic took one of the slick shod race bikes off the pit stands and rolled it out for me. While I put on my helmet and gloves, I asked Thomas Kuttruff, PR Manager for KTM and my instructor for the day, if I should take it easy for the first few laps on the slick tyres. He put one hand on the tyres and said, "No problem, they're still warm from the last session. Have fun." As I pulled out of the pits and got on the gas, I inadvertently pulled a small, unexpected power wheelie. Damn! It's feisty. The throttle response is even quicker on account of the Akrapovic race system and requires an even more precise right wrist. It's a lot louder too and the thundering boom of that v-twin with the stock exhaust is replaced with a snarl from the free flowing pipes. The suspension set up was a lot stiffer too and so it needed you to really commit to a corner or else, with the forks not loaded up, the motorcycle came off feeling a little wooden. With the grip on offer from the slicks, I never came near the limit of traction so I never felt the electronics cut in. That is, apart from the anti-wheelie constantly on down the front straight. 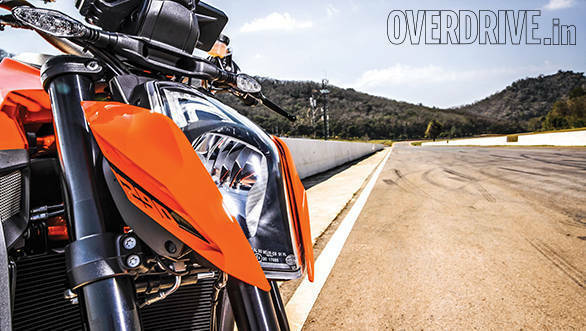 It's a beast for what it can do  it's blindingly fast with traction control on and just doesn't want to stay on two wheels with it turned off. This was dramatically demonstrated by McWilliams as he pulled a giant wheelie down the entire main straight on every single lap. The street bike is also brilliantly easy to ride and you are always in control of how exciting (or scary) you want your ride to be. KTM is mulling over which motorcycle to bring to India in the future as its flagship model for the subcontinent and I'm desperately hoping it picks this absolute monster of a motorcycle.